Although stockholders may benefit from information regarding the frequently substantial charitable and political contributions of the corporations they own, US corporations are typically not required to disclose any information about such payments in annual financial statements or information submitted periodically to regulatory agencies. This lack of transparency is confounded by disclosure requirements of private foundations, which a corporation may choose to establish for the purposes of administering charitable giving for the corporation. The resulting disclosure fog engendered by extant regulations may be confusing to those corporation owners who would like to know what corporation contributions are being made to charities and politicians. 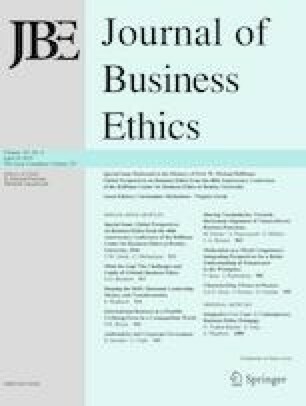 This article enumerates the magnitude of the charitable and political gifts of 40 of the most generous public corporations in the USA, the current disclosure requirements for public companies, the role of foundations, rationales for withholding relevant information from owners, and ethically questionable strategies that corporations may use to manage those disclosures for their benefit. S. Douglas Beets declares that he has no conflict of interest. Mary G. Beets declares that she has no conflict of interest. Allison, B., & Harkins, S. (2014). Fixed fortunes: Biggest corporate political interests spend billions, get trillions. (November 17). https://sunlightfoundation.com/blog/2014/11/17/fixed-fortunes-biggest-corporate-political-interests-spend-billions-get-trillions/. Blumenthal, P. (2012). ‘Dark money’ in 2012 election tops $400 million, 10 candidates outspent by groups with undisclosed donors. (November 2). http://www.huffingtonpost.com/2012/11/02/dark-money-2012-election-400-million_n_2065689.html. Blumenthal, P. (2013). Corporate ‘dark money’ to get free pass after sec drops disclosure proposal. (December 2). http://www.huffingtonpost.com/2013/12/02/corporate-dark-money_n_4372574.html. Carter, E. (2010). What is a private foundation? (June 25). http://charitylawyerblog.com/2010/06/25/what-is-a-private-foundation/. Carter, E. (2013). Is it time to form a corporate foundation? (September 27). http://charitylawyerblog.com/2013/09/27/time-form-corporate-foundation/. Cascino, S., Clatworthy, M., Osma, B. G., Gassen, J., Imam, S., Jeanjean, T. (2016). Professional investors and the decision usefulness of financial reporting. (March) http://www.efrag.org/Assets/Download?assetUrl=%2Fsites%2Fwebpublishing%2FSiteAssets%2FProfessional%2520investors%2520and%2520the%2520decision%2520usefulness%2520of%2520financial%2520reporting.pdf&AspxAutoDetectCookieSupport=1. Accessed 1 Sept 2016. Charity Navigator. (2016). Giving Statistics. http://www.charitynavigator.org/index.cfm?bay=content.view&cpid=42#.VvldGOIrIdU. Accessed 13 March 2016. Cohen, R. (2012). SEC commissioner calls for corporate disclosure of contributions to political nonprofits. (February 27). https://nonprofitquarterly.org/2012/02/27/sec-commissioner-calls-for-corporate-disclosure-of-contributions-to-political-nonprofits/. Common Cause. (2012). New poll: Americans condemn high levels of corporate political spending, overwhelmingly support strong transparency and accountability reforms. (October 25). http://www.commoncause.org/press/press-releases/new-poll-americans-condemn-high-levels-of-corporate-political-spending.html?referrer=https://www.google.com/. Cummings, J. (2015). Transparent win for political disclosures. (March 23). http://www.bloombergview.com/articles/2015-03-23/battle-for-corporate-political-disclosure-gets-a-win. Drutman, L. (2015). How Corporate lobbyists conquered American democracy. (April 20). http://www.theatlantic.com/business/archive/2015/04/how-corporate-lobbyists-conquered-american-democracy/390822/. Elliot, J. (2012). Are corporations claiming tax breaks for super PAC donations? (March 19). http://www.thewire.com/politics/2012/03/are-corporations-claiming-tax-breaks-super-pac-donations/50067/. Farrell, C. (2010). Philanthropy: Companies seek greater returns in tough times. (January 14). http://www.bloomberg.com/news/articles/2010-01-14/philanthropy-companies-seek-greater-returns-in-tough-timesbusinessweek-business-news-stock-market-and-financial-advice. Foundation Center. (2014). Foundation Stats. http://data.foundationcenter.org/#/foundations/corporate/nationwide/top:giving/list/2013. Accessed 9 March 2016. Frostenson, S., & O’Neil, M. (2014). 10 companies that gave the most cash in 2013. (July 13). https://philanthropy.com/article/10-Companies-That-Gave-the/150507. Gilbert, L. (2013). Time for corporations to disclose political contributions. (October 2). http://thehill.com/blogs/congress-blog/politics/326131-time-for-corporations-to-disclose-political-donations#. Goad, B. (2014). New push for disclosures on corporate giving. (September 4). http://thehill.com/regulation/finance/216736-new-push-for-corporate-giving-disclosure. Heavey, S. (2013). Giving USA report: 2012 Charitable giving grew almost 4%, corporate donations grew 12%. (June 18). http://www.huffingtonpost.com/2013/06/18/giving-usa-report-_n_3457244.html. Hindery, L. (2013). Further unmasking corporate political spending. (December 4). http://www.huffingtonpost.com/leo-hindery-jr/further-unmasking-corpora_b_4386215.html. Howard, A. (2016). IRS Opens up form 990 data, ushering nonprofit sector into the age of transparency. (June 16). https://sunlightfoundation.com/blog/2016/06/16/irs-opens-up-form-990-data-ushering-nonprofit-sector-into-the-age-of-transparency/. Lunder, E. K., & Whitaker, L. P. (2013). 501(c)(4)s and campaign activity: Analysis under tax and campaign finance laws. http://fas.org/sgp/crs/misc/R40183.pdf. Marcus, J. (2013). Foundations are increasingly running U.S. higher ed, spending millions to influence. (October 1). http://www.huffingtonpost.com/2013/10/01/foundations-higher-ed_n_4023826.html. McRitchie, J. (2015). Investors seek disclosure of corporate lobbying expenses. (March 13). http://www.corpgov.net/2015/03/disclosure-of-corporate-lobbying-expenses/. North Carolina Department of State Treasurer (2015). Cowell, state treasurers call on SEC to strengthen disclosure of corporate political contributions. (April 21). https://www.nctreasurer.com/inside-the-department/News-Room/press-releases/Pages/Cowell-State-Treasurers-Call-on-SEC-to-Strengthen-Disclosure.aspx. Overby, P. (2015). Foundations to SEC: Force corporations to disclose political giving. (May 19). http://www.npr.org/sections/itsallpolitics/2015/05/19/408010757/foundations-to-sec-force-corporations-to-disclose-political-giving. Stern, K. (2013). Why don’t corporations give to charity? (August 8). http://www.slate.com/articles/business/moneybox/2013/08/corporations_don_t_give_to_charity_why_the_most_profitable_companies_are.html. Sunlight Foundation (2014). Fixed Fortunes. http://influenceexplorer.com/fixed-fortunes/#data-intro. Vandewalker, I. (2013). The SEC takes a step toward transparency in corporate political spending. (March 11). http://www.huffingtonpost.com/ian-vandewalker/the-sec-takes-a-step-towa_b_2432626.html. Winkler, A. (2013). Political corporate contributions won’t be aired in daylight. (December 5). http://www.thedailybeast.com/articles/2013/12/05/political-corporate-contributions-won-t-be-aired-in-daylight.html.